The term 'Class A' is often misunderstood, but it's generally seen as the 'Holy Grail' of surface modelling. This is because as it achieves the highest surface quality levels, and it demands a high level of automotive design knowledge as well as surface modelling skills. The Class-A modelling process typically starts with a fully developed design, either as a scanned clay model or an Alias model. Because the design isn't changing, the modeller has the time to build surfaces to the highest quality standards, ready for production. In Alias this is achieved by using the right Construction Tolerances before you start modelling, for example 'Catia V5'. It's important to note that there are no absolute rules for tolerances or continuity levels. It is part of the skill and knowledge of the Class A modeller to be able to judge which settings will result in the right quality in the production car. 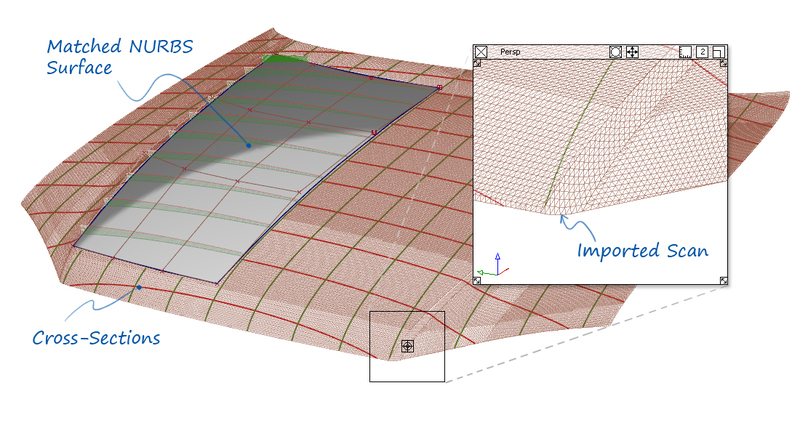 Direct Modelling of the surface CVs combined with interactive evaluation of the continuity. Continuity Flow: Diagnostic Shading → Iso-Angle and Diagnostic Shading → Light Tunnel. It's not possible to give a generalised set of standards here, as this knowledge is part of the profession of Technical Surfacing and the proprietary expertise of each company, and so needs to be learned within the industry. The modeller will be given a tolerance by which the NURBS data must match the scan. However, scan data will always have some imperfection, or 'noise', and there also may be imperfections in the clay model. Class-A modelling is slow and methodical. Therefore it is used on the final model iteration, once the design has been 'locked'. During Concept Modelling, the design changes are too rapid for strict Class-A standards to be applied. However, if Class-A principles are applied then the handover of data to Class-A modellers will be more effective.